The vibraphone is a beautiful instrument that set the tone for many a jazz tune. There have only been a few musicians that have carved out their own identity on the vibes. 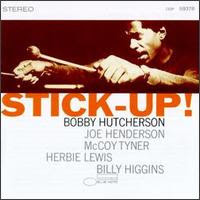 Bobby Hutcherson is one of those few over the last five decades (along with Gary Burton) to change how the instrument is perceived. At times I feel as though Hutcherson has created a whole new instrument by the manner in which he performs. The model structure is completely original and challenges you to listen to every intricacy. Bobby Hutcherson was born in California and originally studied to play piano but switched to vibes very early on. He was highly influenced by the great vibraphonist Milt Jackson but studied under another, Dave Pike. Bobby would later perform along side such greats as Curtis Amy, Al Grey and later with Jackie Mclean and Eric Dolphy in addition to a small number of albums as leader. But it was after a move to New York that the jazz scene on both coasts would know of the kid with indescribable sound on the vibes. Hutcherson would soon runoff a string of important albums with Blue Note Records. The album that has always stood out for me is Stick Up! (Blue Note). Stick Up! features a quintet of future legends at the peak of their powers: Joe Henderson (sax), Billy Higgins (drums); Herbie Lewis (bass) and McCoy Tyner (piano). This is a sizzling session that you will want to spin again and again. Hutcherson is in fine form and rips through his interplay with the rest of the band with ease. The harmonics and layers of this album are absolutely stunning and that's why I think Stick Up! 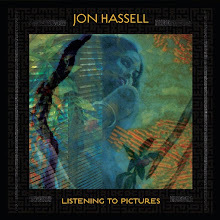 is a classic jazz album of note as well as being one of the best Blue Note Records ever recorded.